File photo of a Border Patrol agent. U.S. Sen. Jeff Flake and Heidi Heitkamp introduced legislation aimed at increasing the number of Border Patrol agents at ports of entry. The legislation, the Customs and Border Protection and Hiring Retention Act, is deigned to eliminate recruitment obstacles and help retain agents, the Republican and Democrat said in a press release. 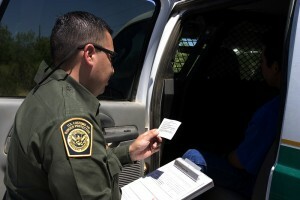 The senators said Border Patrol is short of about 1,000 agents. The legislation would provide incentives for Border Patrol agents to stay on the job and not go to other agencies. “In my visits with border security officials and personnel in Portal last month and Pembina last year, a key concern I heard over and over from agents on the ground was about their abilities to both attract and retain quality workers to best protect our communities – and it’s those challenges that our bipartisan bill would work to address. This effort expands on my work in the U.S. Senate to make it easier to hire and retain federal employees, like border patrol agents, at remote locations such as at the Northern Border. And my bipartisan bill to assess threats to the Northern Border and examine employee recruitment and retention issues is expected to soon be signed into law. Our border patrol agents work to keep our borders protected, and they need to have the resources and support to keep our communities safe,” said Heitkamp, D-N.D.
Posted: 12/7/16 at 10:49 AM under News Story.